Mre. Pelosi promised to “drain the swamp.” Not only has Mrs. Pelosi not drained the swamp, she is lost in it. Rather than completing her promised one hundred hours of legislation, she is in San Francisco. . So what is Mrs. Pelosi doing in San Francisco? I had thought that Mrs. Pelosi had promised to pass her critical one hundred hours worth of legislation. I write this on January 16 Congress took office on January 4. That is darn near two weeks and Mrs. Pelosi has yet to complete her one hundred hours of work. Oversight! Unlike Mrs. Pelosi, I have read the Constitution the United States. No where in the Constituion is Congress given oversight over the war powers of the President as Commander-in-Chief. Escalation! What escalation? We stepped over the line with about three hundred thousand troops. We have had over one hundred fifty thousand troop in country within the last year. Now the President is taking the troop level from about one hundred ten thousand to one one hundred thirty thousand. Troop levels have flucuatated. 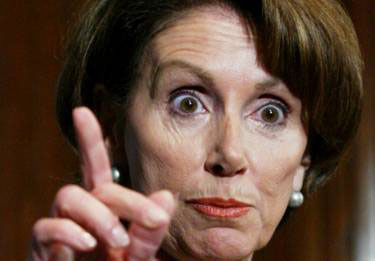 Now Mrs. Pelosi wants to call the lastest flucuation an escalation. Give me a break. Sure the President has a plan. That is about what Mrs Pelosi and Jack Murtha are throwing a hissy fit. IF Mrs. Pelosi, the one woman Congress, has a plan for Iraq, it sure has escaped the attention of the talking pundits, ala Tim Russert, the entire MSM and Google. If Mrs. Pelosi has a plan, nobody in the media is talking about it and I can’t find it. Yet I am sure that Karl Rove with his telepathic powers has somehow divined Mrs. Pelosi’s plan and briefed the President. Maybe Mrs. Pelosi needs to subpeona the appropriate PDB? Mrs. Pelosi do you need a loan of a compass? San Franciso is on the West Coast. The House of Representatives is on the East Coast. The Framers did not establish a parliamentary system.